A few months after my wife died, a colleague told me that I should write a book, and do what C. S. Lewis did in A Grief Observed. This struck me as crazy: I am no C. S. Lewis! But gradually the idea took root that I did have something to say that might be useful. I had been through something that happens to many people, one way or another: caring for a loved one through a long decline. What, people might wonder, would a “professional religious person” do when such a thing comes home to him or her? Would he or she continue to believe? How would his or her beliefs be altered? So, I wrote the book not for myself, but for my readers, to try to be honest about my Christian faith, my own struggles and questions, and to give a testimony of how God was with me and with Susan in all of this. 2. If you have to list three key takeaways from this book you would like for the reader to experience, what would they be? First, that we don’t need to try to be “religious” or pious when going through suffering, but rather we should just be, as naturally as possible, completely open with God. Second, that it is okay to ask all the old questions, e.g., “Why is this happening to me?” “Where are you?” and so forth. I believe that God gave me my heart’s desire when He gave me Susan, and I also believe He took her away (at least in the sense that He could have arranged things to turn out differently). I asked these questions often throughout this journey. Third, despite God’s strangeness, He is still present to us. This is, in a way, the point of my testimony: that even though I often didn’t sense it, He was there, and He is here. 3. Do you have a favorite passage or chapter in this book? But actually, my favorite passages of the book are those written by Susan. Early on I quote from her writings, to help the reader get to know her. Then, as an appendix, I put a story she wrote about trees weeping, which I call, “To Plumb the Depths of God’s Love.” The best writing in the book is hers. 4. If you were sitting beside the reader, what portion of the book do you feel you would want him or her to spend extra time on, and why? I think it would be the section on Jesus saying, “My God, my God, why hast Thou forsaken me?” I say this because Jesus went down to the very pits, to the lowest places in the universe, further down than any of us ever has to go, down to the very bottom. The Son of God experienced forsakenness, and yet—how had I never noticed this—even with that experience He was able to ask “God,” indeed “my God,” a question. This is something I still ponder. I think it is the greatest mystery of the Christian faith, profoundly Trinitarian, and in truth the most hopeful thing. 5. In what specific ways can this book equip, encourage, and/or instruct ministers? 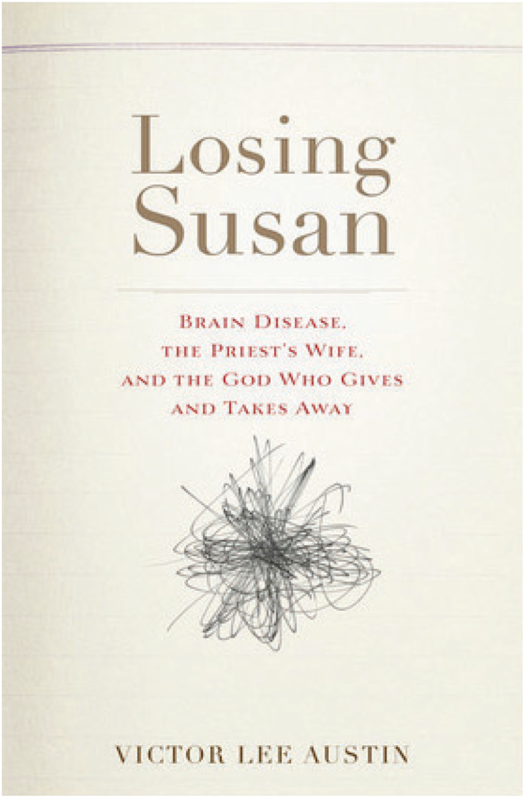 Ministers have written to me about how Losing Susan has helped them make sense of their own experiences of care-giving and loss. It is also a book you can give to someone who is going through a similar journey. Fundamentally, the book is encouraging, because we believe in the resurrection!